I have recently started teaching my four-year-old to read and seeing how quickly she has picked up on it, as well as how keen she is to learn, has me thinking that now might be the perfect time to introduce another language. I just so happen to remember a few words from my high school French class and these bilingual matching tiles will make teaching her a fun bonding experience for the both of us. Translate Tiles from Tree Hopper Toys are the perfect teaching aid to help your little one learn a second language. Made in America from premium maple plywood and a non-toxic water based ink, they are perfect for children aged three and up. Not only will preschoolers learn a new language, but they will also work on memory skills as well as hand-eye coordination matching the pieces together. All 48 pieces come in a printed drawstring bag for a tidy and easy pack away. Putting your little one’s mind to work all while having fun and learning skills that will benefit them as they grow. 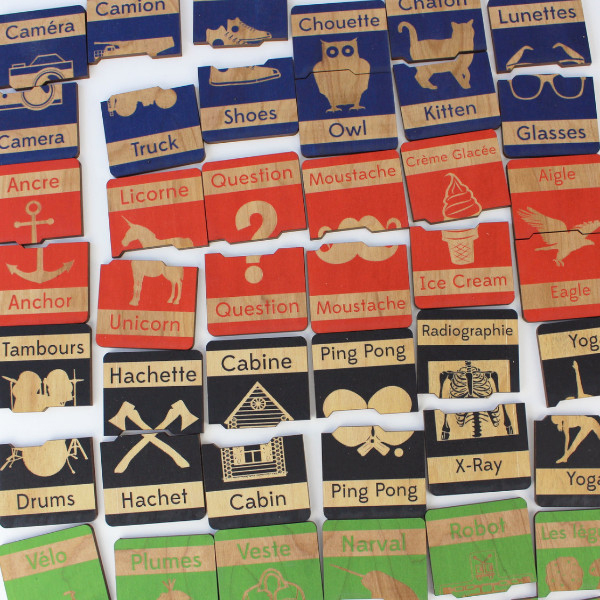 The tiles come in French or Spanish sets for now, with more languages expected to be added. Available online from Tree Hopper Toys for US$30.